Some of you may remember Brainbot, a project directed and funded by the Brain Engineering Laboratory and Neukom Institute at Dartmouth College, designed in collaboration with Jon Hylands and HUV Inc. The purpose of which is to enable the study and practice of brain engineering. Well, Brainbot is getting a brain transplant into a 1/5 scale top of the line rock crawler chassis, for the purpose of creating a navigation variant. Onboard smarts? A Core 2 Quad, 2.83 GHz, 2 GB RAM, and a 32 GB Solid State HDD, 802.11n wifi, GlobalSat USB GPS, Prosilica gigabit ethernet camera (640 x 480, 60 fps) which plugs into Roborealm, and a Hokuyo UTM-30LX scanner laser rangefinder. Right now, it has the quad core mini-itx mounted, and is being driven around with my Logitech wireless joystick. The motor driver (a Sabertooth 2×25) is controlled from one of my Bioloid I/O boards, which is connected to the bus. 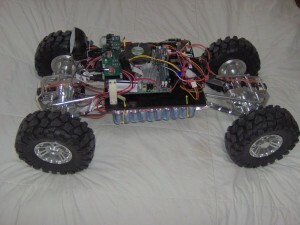 A program (written in Squeak Smalltalk) takes the joystick input, and sends speed and steering commands over the bus to the I/O board and the steering servos (AX-12’s). Edit: Another Video just posted!